On our recent trip to Boston, we spent part of a day walking the Freedom Trail, a brick-lined route that visits 16 historically significant sites. With plenty of little parks along the way, we planned to have a picnic. A visit to CocoBeet was perfect for picnic provisions! 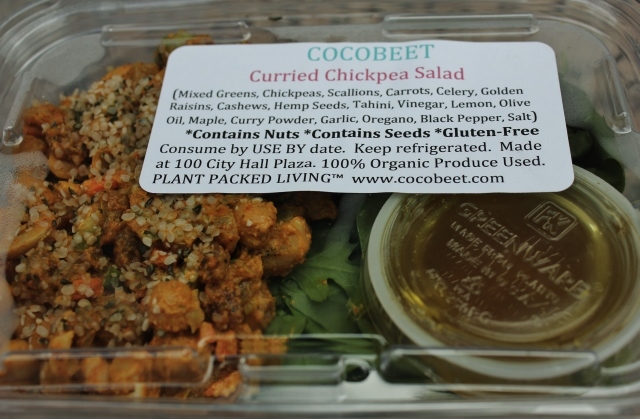 CocoBeet is located in City Hall Plaza, just a short little diversion from the Freedom Trail. 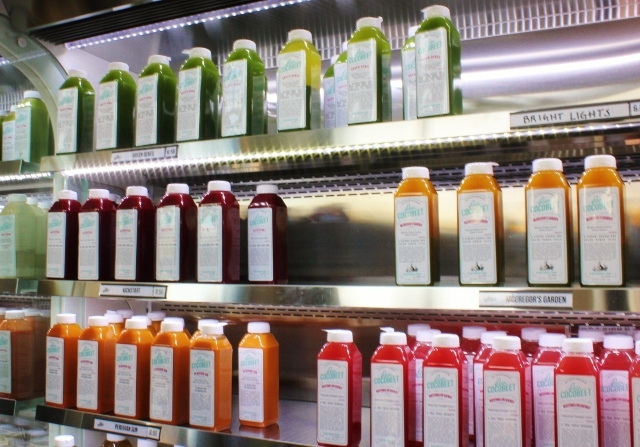 It’s a carryout only spot packed full of juices, smoothies, salads and tasty nibbles. We grabbed a juice and a smoothie. The Watermelon Quench juice with watermelon, pineapple and lemon was light and only slightly sweet. 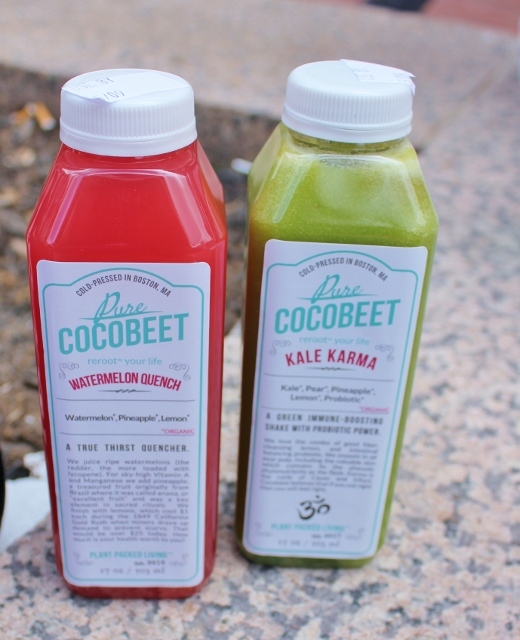 If I lived in Boston and could go to CocoBeet often, this would be my summer drink. The smoothie we tried was Kale Karma with kale, pear, pineapple, lemon and probiotic. Nice to have an all-natural, mid-day energy boost from kale! You know how you want to try one of everything on the menu? Yep, that’s what happened when we tried to choose salads. We bought two. First, the Quinoa Burgers on Arugula. The little quinoa burgers, more like a fritter, falafel or a slider size burger, were so good with the spicy almond spread and peppery arugula. Second, we had the Curried Chickpea Salad. We eat a lot of chickpeas and a lot of curry at home. This was the perfect combination of the two. 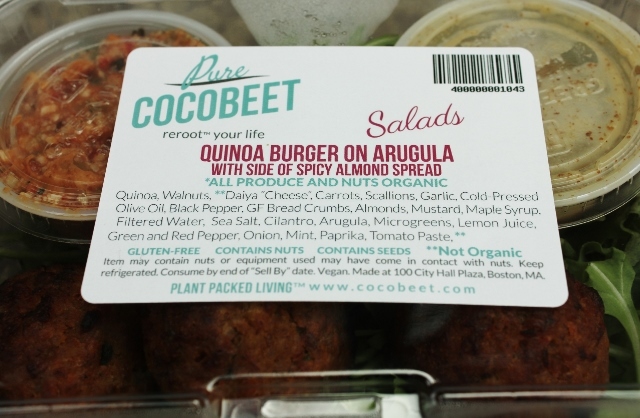 I liked that all of the items are clearly labeled with the ingredients at CocoBeet. This makes selecting a meal much easier for me. I wish more places would do this! 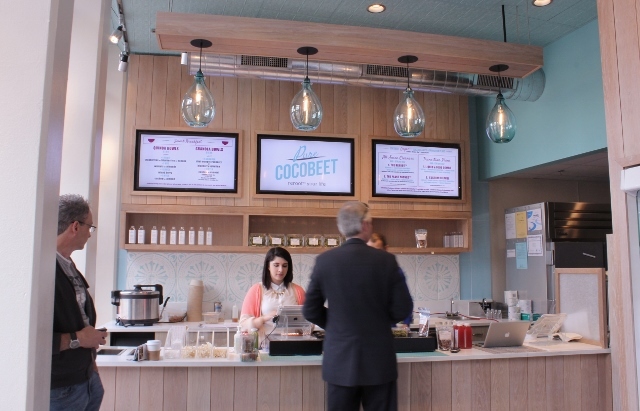 The owner of CocoBeet is very knowledgable (he is an Institute of Integrative Nutrition graduate) and was super friendly. I noticed him calling a customer by name, so I hope that means even though CocoBeet is relatively new, they are already building a loyal following. Everything I tried here was so good I’m sure I would be among those loyal followers if I lived or worked nearby. Eat With: Moderate Caution. At the time of my visit, the only items containing gluten were sandwiches, which are made on sprouted bread. Each item is labeled with ingredients. Please read the label carefully, make sure it matches what is in the box and verify at the counter when paying that your selections are gluten-free if that is a concern. 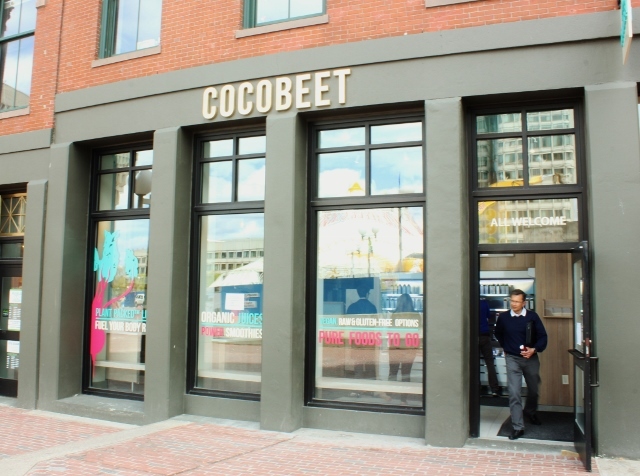 CocoBeet is located at 100 City Hall Plaza, Boston, Massachusetts. 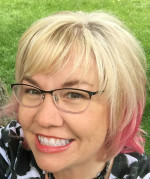 857.263.8598. Just never found them tasty and generally they taste like dirt to me. Not even Wolfgang Puck’s beets did it for me. But some of the other food pictured looked quite tasty. I am a big fan of beets, steamed, roasted, pickled. My fella, however is not a beet fan but likes beet juice. Surprising! We did really enjoy the food at CocoBeet!